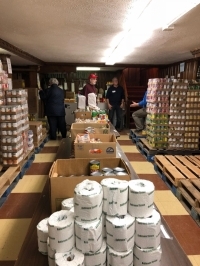 The food pantry is located in the basement of the St. Philomena Church rectory in East Cleveland. A March 4 fundraiser at Lopez Southwest Restaurant is planned to raise awareness of, and donations for, The Father Michael Wittman Ozanam Center. This all-volunteer food pantry and clothing bank, located at the St. Philomena campus of Communion of Saints Parish, operates with the support of volunteers from 15 churches and other organizations on Cleveland’s East Side, including Cleveland Heights’ Communion of Saints Parish and Church of the Saviour. A registered agency with the Greater Cleveland Food Bank, the center operates every Saturday, 10 a.m. to 1 p.m. Each week it provides 75 families with free food and clothing. It has been serving families in East Cleveland and the surrounding area since 2006. The original center was established at the former Christ the King Church on Noble Road in memory of the late Father Michael Wittman, who was known for his outreach and commitment to neighbors in need throughout East Cleveland and Cleveland Heights. The center moved to its current location in 2010, when four Catholic parishes—St. Ann, St. Lewis, St. Philomena, and Christ the King—were consolidated into the current Communion of Saints Parish. With ongoing demands for food and clothing, the center will hold its first fundraiser on Monday, March 4, 5–9 p.m., at Lopez, 2196 Lee Road in Cleveland Heights. All tips on purchases that evening will go toward the continued operation of the center. The event will also feature a Chinese auction, and musical entertainment provided by local favorite The Rifferees. For more information, e-mail cliott216@yahoo.com, or call 708-606-0863. Carol Iott, a Cleveland Heights resident for 13 years, is a member of Communion of Saints Parish.